Natalia Fedner is a Los Angeles fashion designer, most recently known for her participation in Project Runway’s Under The Gunn. 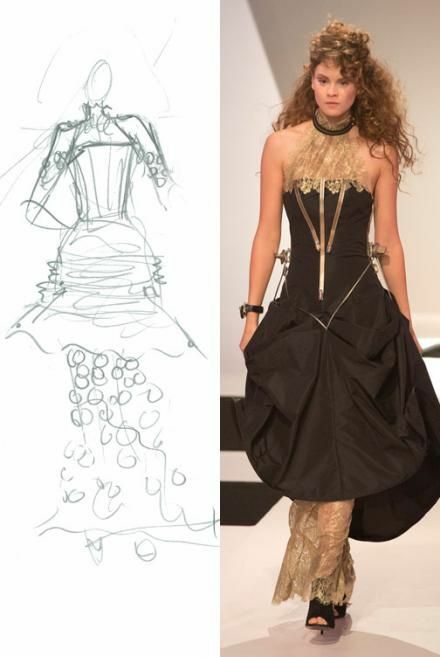 Our favorite Natalia design from the show was a fantastically innovative Steampunk ensemble with a mechanized skirt. We became fans of Natalia while watching Under The Gunn, and love her exceptional designs. Project: Make It Work recently caught up with Natalia to check in with her about all the fantastic things she’s been doing since the show. A touch scandalous, a touch classic- but always innovative. More art and invention than straight fashion. Heavy on knitwear and unorthodox materials or materials used in unorthodox ways. 3. What was the most challenging thing about the Under The Gunn experience BESIDES the challenges themselves? The time pressure, and isolation from all the comforts of life (friends, family, sleep, the internet). 4. Who have you met or worked with during or since the Under The Gunn experience that you are most proud of or excited about? I had the opportunity recently to dress Jennifer Lopez for her “First Love” music video. She wore one of my chiffon and knit silver gowns. She looked gorgeous, and I was so grateful to her stylists and Entertainment Tonight for mentioning my designs in their interview with her! I also had the pleasure of working with Shakira, and a gown of mine was worn to the Oscars by Joanna DeGeneres (Ellen’s sister- in-law). 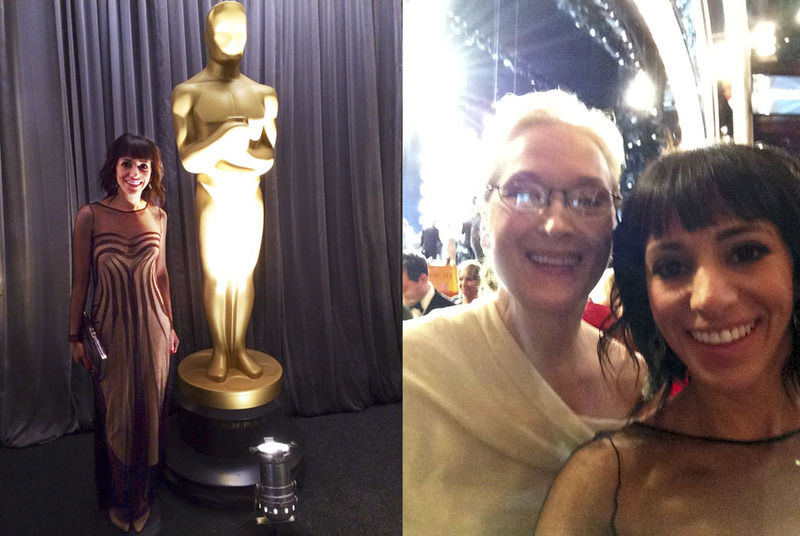 Joanna DeGeneres and Meryl Streep at The Oscars. 6. How has social media impacted your life after Under The Gunn? 7. What are you currently working on or excited about professionally? I just bought two computerized knitting machines and am hacking them (yup, I’m a tech geek) to knit any image I would like. I’m pairing this tech aspect with my penchant for unusual/high end materials to create some truly mind-blowing art fashion. It’s like a big fun experiment, and since I love inventing things- it gives me a rush to wake up every morning with endless possibilities at my fingertips. 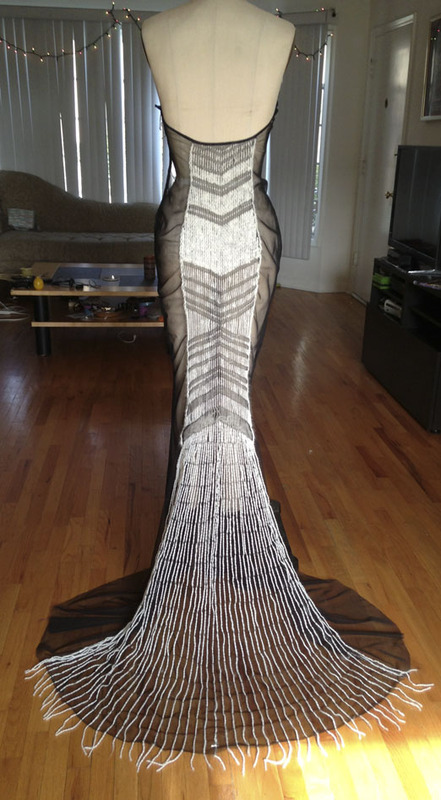 I am thrilled to continue working with Hollywood stylists to get my avant-garde dresses on some of my favorite icons. 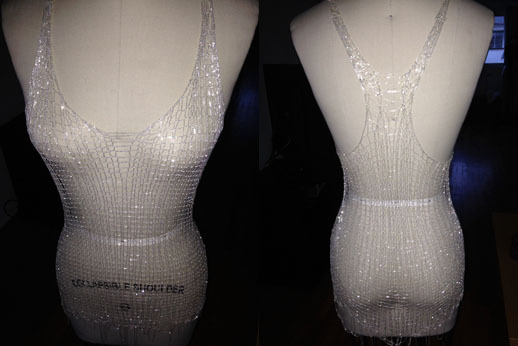 Recently, Shakira took my entire collection with her to Spain for a shoot- and even purchased one of my dresses! She’s always been an inspiration to me, so this was very humbling. I’m incredibly grateful to her. 8. Is there anything else you’d like us to know or see? Just a life philosophy: Be good to people. It sounds so simple – because it is. There are many roads to success, and it’s up to you which path you choose. I have found that treating people with kindness, realizing there’s always more than meets the eye, and not judging too hastily, has allowed me to achieve success without hurting anyone in the process. When you are good to people they are more likely to help you, to be good to you, to care for you. So it is very simple – and it feels really good – be good to people! And be good to animals, too. I don’t use fur, leather, or wool in my designs. Any angora I use is sourced from pet bunnies. All interview text and photo content provided by Natalia Fedner, unless watermarked, linked, or specified.